Flying "G Adventures - Treating Customers Unfairly This is not a trip review but rather comment on their customer service. I booked the “Quest for the Antarctic Circle” almost a year before the trip and paid the full price for triple share as posted at http://www.gadventures.com. Later, my friend told me that she was interested to join me but at that time, only twin share was available. As this was ov..."
Start and end in Ushuaia! With the ocean cruise tour Quest for the Antarctic Circle, you have a 14 day tour package taking you through Ushuaia, Argentina and 2 other destinations in Argentina. 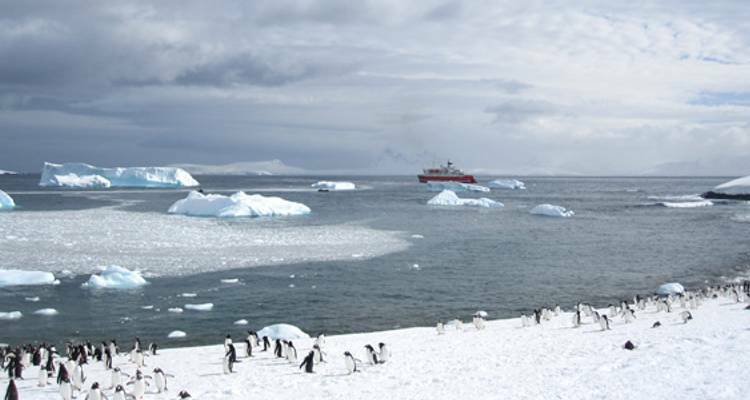 Quest for the Antarctic Circle includes accommodation in a hotel as well as an expert guide, meals, transport and more. Excellent trip. Well planned and executed by staff. Great on shore landings and zodiac cruises. Go! Mind blowing scenery in an amazing place. We spent two days south of the Antarctic Circle. G Adventures were fantastic in all regards, great ship and incredible crew. A trip of a lifetime. MS Expedition was wonderful with superb, inspirational staff. The place itself is an absolute must-see. A brilliant trip with a wonderful staff. TourRadar only requires a deposit of $99 to confirm this G Adventures booking. The remaining balance is then payable 65 days prior to the departure date. For any tour departing before 30 June 2019 the full payment of $9,214 is necessary. No additional cancellation fees! You can cancel the tour up to 65 days prior to the departure date and you will not need to pay the full amount of $9214 for Quest for the Antarctic Circle, but the deposit of $99 is non-refundable. But, the deposit is fully transferable to future bookings with G Adventures. Covering a total distance of approx 3,962 km.